It will be a sunny and hot weekend here in the Catskills. We're likely to see the hottest temperatures so far this summer (well into the 80s and close to 90s in the lower areas of the mountains), so be properly prepared. Stay hydrated, use sunscreen and pace yourself during outdoor activities. Forecast: Friday will be mostly sunny with a high around 80 degrees. Friday night conditions remain clear and the low temperature will be around 60 degrees. Saturday will be sunny with a high that will be in the upper 80s with increasing levels of humidity. Saturday night, lows will only dip into the upper 60s. Sunday will also be mostly sunny, but with an increasing chance of thunderstorms, especially into Sunday evening. The high Sunday, even in the mountains is expected to be close to 90 degrees. Sunday night there's a chance of thunderstorms and the low temperature will be in the upper 60s. CAUTION: High temperatures and lots of sunshine can combine to cause heat exhaustion and heat stroke when you aren't properly prepared. Be sure to carry plenty of water and keep yourself hydrated. 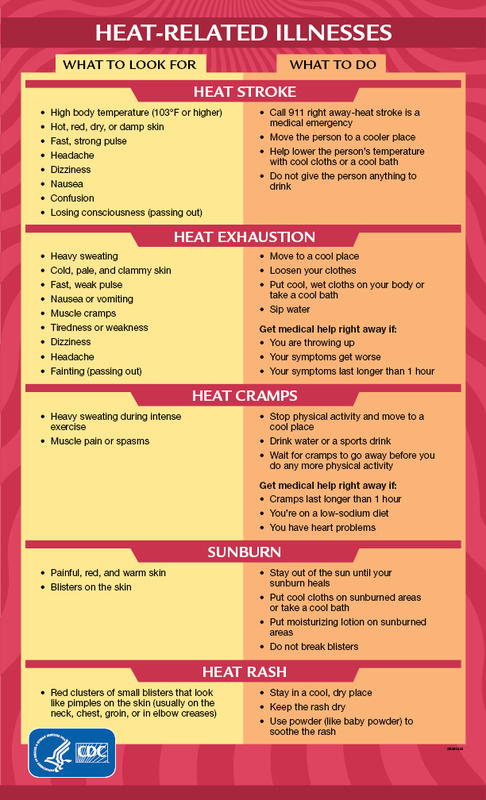 Know the signs of heat stroke and heat exhaustion. Insects: The black flies are out. It's a good idea to use bug spray and bring a head net if you want to make sure you keep the bugs away. Rainy weather tends to dampen their activity. Mosquitoes are also present throughout much of the Catskills. Trail Conditions: Trails are snow-free. Most trails have dried out. There are a few muddy areas remaining, so be sure to follow good hiking practices on muddy trails by walking down the middle of the trail, even when muddy, to avoid widening trails and creating more erosion. Weather: Always be aware of and prepared for changing weather conditions in the Catskills. Being properly prepared for the weather and conditions will help to ensure a safe and enjoyable time in the outdoors. Check the current National Weather Service Weather Forecast. The NY Mesonet has stations in and just outside of Catskills that provide real time weather data and forecasts. Hudson Valley Weather provides detailed forecasts for the Hudson Valley and the Catskills. Leave No Trace / Carry It In, Carry It Out: The Catskill Park is a carry it in, carry it out park - please be sure to take all of your trash home and be sure to Leave No Trace during your visit to the Park. For More Information: Visit the Catskill Park's visitor center, the Maurice D Hinchey Catskill Interpretive Center at 5096 Route 28 in Mt Tremper, NY. The Center is open everyday from 9:30 to 4:30, and until 6:30pm on Fridays. The CIC is the Visitor Center for the Catskill Park. Staff and volunteers can provide trail information and updates. The CIC's Gift Shop carries trail maps, trail guides and more for purchase. You may also shop from home at the Catskill Interpretive Center Online Gift Shop. You can all the CIC at 845-688-3369 or email them at info@catskillcenter.org.